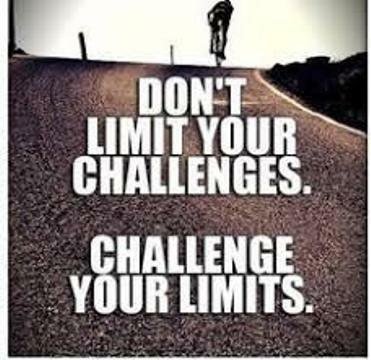 Challenge Your Limits! – Motivational Mantras!! A successful person is never satisfied with all what he has achieved in his life, not because he doubts on his potential but because, the zeal to do more and something new in life is always on fire inside him. This zeal is something that always makes a person keep going towards achieving more and more in life and he always gets to discover something or the other good about him. Have you ever thought about, who has limited you? Did your destiny came to you and said that you can’t do this or that thing? Did God tell you that you are not able to do this thing in your life? No, right? Then why do we limit ourselves from doing such things that we are capable of doing? Why don’t we think of doing something before we think we can’t do it? Why do we limit ourselves even before knowing our limits? Ever thought about it? I’ve mentioned in one of my earlier posts too that you are capable of doing more than what you actually think you can do. This is the truth. It is us who get influenced by people around us who judge us that we can’t do something or the other and we take it as a fact, not as a judgment. This mind is always attracted easily to the negatives of the life more than the positives of the life and this is the fact that when someone judges our potential that we are not capable of doing a particular thing, we believe them and apparently think of all the reasons of why we can’t do it rather than thinking of how we can do it. Sometimes we do feel the urge to do something in life that we love to do, but the fact that nobody in our surrounding has done such a thing before, we stop right there. But, have you ever thought that this urge is actually your chance to do something exceptional, something such different for which only you will be known? That urge is your chance to bring the change and challenge your limits to ultimately discover how much more you can achieve in life than you always think you can. You have to go beyond your limits to achieve something worthy in life and always remember the more exceptional you will be, the more you’ll be recognized. Let’s just lit fire on the engine of our talents, our dreams and start a life that we’ve always wanted to live. Let’s not sit pessimistically at our homes accepting the judgments people pass on us as we are born not to prove them anything, but to prove ourselves our worth. You, my friend have a whole world out there waiting for you; you can do wonders in your life. All you have to do is to look beyond the limits you’ve set for yourself, to achieve more than you think of achieving. You have to challenge your limits and then you’ll yourself be surprised by your priceless worth. You’ll realize that you were the one who has limited yourself from going beyond the full stops that the society has created for you. Start making each full stop a comma and continue achieving all you deserve in your life so that your each and every success is recognized by the world and you keep on challenging your limits to achieve more and more and more……………….. Challenge your limits, look beyond them and you’ll always discover a new you! Previous Grow Through What You Go Through! Next The Expert too was once a Beginner!